JSON parsing in Apex, a developer’s nightmare :( Winter’12 release I badly need you ! Today I stumbled upon a requirement to parse JSON in Apex. I was happy about the fact that I know there is a cool open source library called JSONObject, that will do all the heavy lifting of JSON parsing and another more cooler native JSON parser is lined up in coming winter'12 release. I was able to quickly setup the web service fixture using all goodness of dependency injection for callouts in apex, as discussed in this post. “JSON response vs JSONObject Parser” the bloody war ! The real pain started when I started parsing JSON response. I met a series of awesome exceptions and errors, leaving me confused about who is wrong JSON or Parser :-? I was again thinking, now what who’s wrong here JSON or Parser :-? Again after some fighting with code, I ended up on google searching for the same and luckily found metadady already fixed this one. Many thanks to metadady, for fixing this issue and submitting a patch, I don’t know why this patch is still not applied on JSONObject since Jan 24, 2011. “154574” script lines for parsing a moderate json string. It was a strange feeling of loosing everything after you won, words can’t express it. I was having some hope, that I can get rid of it. But but but, it was all lost when I read this post from legendary Jeff Douglas. It was an unlucky Googling day for me, if this Jeff’s post could have appeared earlier, I could be more happy guy by EOD. Anyway, game is not over yet. I am waiting for winter’12 release and native JSON parser i.e. SYSTEM.JSON to come. Thanks to Salesforce team for finally adding a native JSON parser to the Apex library. Fixing connection issues with Salesforce Servers in browser & Force.com IDE. If you are guy who “loves to” or ”has to” work from multiple locations i.e. home, office, client site & coffee shops etc. Then you might have faced the problem connecting to Salesforce and some other web destinations. fails to connect to salesforce api serves i.e. na7-api.salesforce.com etc. Response time for refresh/save is difference across spaces, for ex. runs faster in coffee shop but, runs slower in office network. Do you have any easier fix for this, please share ! Is Apex System.runAs() not resetting the context for CRUD/FLS changes in profile ? While writing an apex test case I noticed a strange behavior with System.runAs(). My tests were failing incorrectly, because system.runAs() was somehow not resetting the CRUD/FLS context for different profiles across same or different test method executions. Here is the complete Test class with all comments and required code. To test it one can deploy this to their DE org directly, it has no dependencies. This test class has two test methods, i.e. Both of these methods doesn't execute correctly. Though if we comment and execute both these testMethods one at a time, they will behave correct. when they execute one after another. of sharing rules etc, but doesn't enforces the FLS correctly ? Looking forward for your views on this. But this seems to be a bug in System.runAs() implementation, what do you say ? Dependency Injection for ease in Testing Apex WebService Callouts ! Apex developers, who are using Http Restful classes know that testing the callouts is not allowed in Apex. People came up with there own smart ways to handle this restriction. For ex. It can be simplified now after availability of Test.isRunningTest() method, this method came in recent Salesforce release and was not available at the time Scott wrote the post(May 2009). Testing the web service code with variety of XML/JSON responses, status codes, and response headers. One can change it to return different xml responses for each test method but using variety of status codes, response headers etc is not easy job. Dependency Injection is a cool pattern to reduce coupling. In this scenario the biggest coupling to break was dependency on Apex HTTP class to make the callout. Here is my attempt to do the same using Manual Dependency Injection. To do the same I defined contract for two key players/dependencies in HTTP callout flow i.e. Please Note: Throughout the code samples coming below, I tried adding a lot of inline comments rather blog text to make the explanation easy. As name indicates its an interface that defines contract for HTTP response. For least learning curve, all methods of this interface are exactly similar to what Apex HttpResponse class offers. This interface is having a single method with arguments similar to the Apex Http class, only difference is in the return type i.e. IHttpResponse. Contract for a simple web service callout using Apex. Only a single method is available for abstracting the stuff out for ease of Testing. Test classes can provide implmentations of this interface to return custom/fake/mock HTTP responses. Accepts a ready to send requests and makes a callout using that. Implementing contract for both Real World & Test Simulation ! OK, we have figured out dependencies now and defined a clear contract for both too. Now its time to implement the same contract for both the Apex real and test execution. This implementation is a simple wrapper over existing Apex Httpresponse class. Default wrapper implementation over standard Apex HttpResponse class. All contract methods of IHttpResponse are delegated to the wrapped Apex HttpResponse instance. This implementation is a delegate again to standard Apex Http class for the critical “send(HttpRequest)” operation. Please note DefHttpCallout.send() doesn’t returns HttpResponse, instead its returning IHttpResponse. Handle to easily switch between natural HTTP callout and Mock Callouts for test cases. it really handy in test cases to change. Here MockAWSCallout is a fake implementation that will simulate HTTP callout for sake of test cases. Please Note: this method is just for illustration purpose, not ready to be used as it is. /// Do what else is biz requirement with the response. For starting up with test cases, an intermediate base class is introduced that gives a complete virtual implementation of IHttpResponse. By complete virtual I mean, any operation will throw exception, as its virtual. This class is meant to give a full virtual implementation of IHttpResponse, so that test cases can only override the response methods as required. For ex. in most of the cases we need only HttpRespone.getBody() or HttpResponse.getStatusCode() only. Indicator for operation being accessed is virtual as of now. Meant to be base/parent class for Apex test case simulations. override the methods required, instead of implementing the whole IHttpResponse contract. For ex. in most of the cases, one will override getStatusCode() and getBody() for testing purposes. For the AWS sample, we need to work with three response param i.e. body, status and statuscode. So this class utilizes the MockHttpResponseBase and gives implementation of the required methods. This gives a mock implementation to the callout behavior. Here various test methods can tweak it easily to return the required Mock responses. as its one of the way test case can pass mock response to it. I didn’t used Test.isRunningTest() anywhere in the code above to know if the code is in Test Context. This is a good api, but Apex gives decent inheritance and polymorphic behavior to achieve the same. WS.cls : WS is short form of WebService, it’s a sort of package class having all the core interfaces and default implementation classes as child classes. AWS.cls : A class having sample callout illustration to Amazon S3. This class uses the WS.cls fixture. Test_AWS.cls : Test cases indicating how the WS.cls fixture can be used for mocking up the callouts. I hope this fixture will help making life simple with Apex Web Service callouts and testing. Looking forward for your views on this. Seesmic CRM for Salesforce (Android Version) reviewed ! Seesmic CRM for Android and Ipad was announced near Dreamforce. The ipad version is coming soon, and Android one is available as beta in Android Market Place, one can download the android app from here. Playing with Seesmic CRM for Android ! I spent some time with this app, here are some screenshots of what I did in order from left > right and top > bottom. Please hold your mouse for a while on image for more details about it in tooltips. What I liked about Seemic CRM for Android ! Doesn’t asks you for password, uses oauth. Gives across object search in leads, contacts & opps etc. Shows Chatter feed and activity log together with object details as shown in above images. Very buggy beta release, don't want to discuss the bugs here. I hope next update will fix most of the issues. Its still not at all close to what Salesforce Mobile is giving already to iPhone, Blackberry and Windows Mobile users. Though it comes at some cost, but that is not always the case. “Salesforce Mobile” is free for Unlimited Edition customers; available in Professional Edition and Enterprise Edition for $50/user/month. Looking forward for your thoughts on this post. 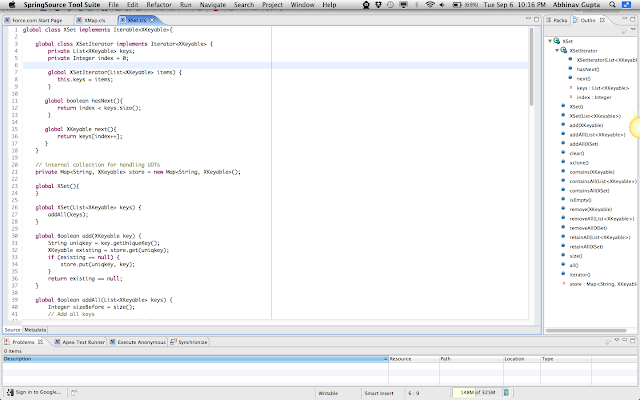 Playing FullScreen in Force.com IDE (Eclipse) for Mac OS X Lion ! One of my favorite feature in Mac OS X Lion is support for Full Screen Apps. I very much wanted the same support in Force.com IDE (Eclipse). As Eclipse indigo was released a bit before Mac-Lion, so it missed that support. Good news : A small eclipse plugin can easily enable full screen support on Eclipse 3.6+. 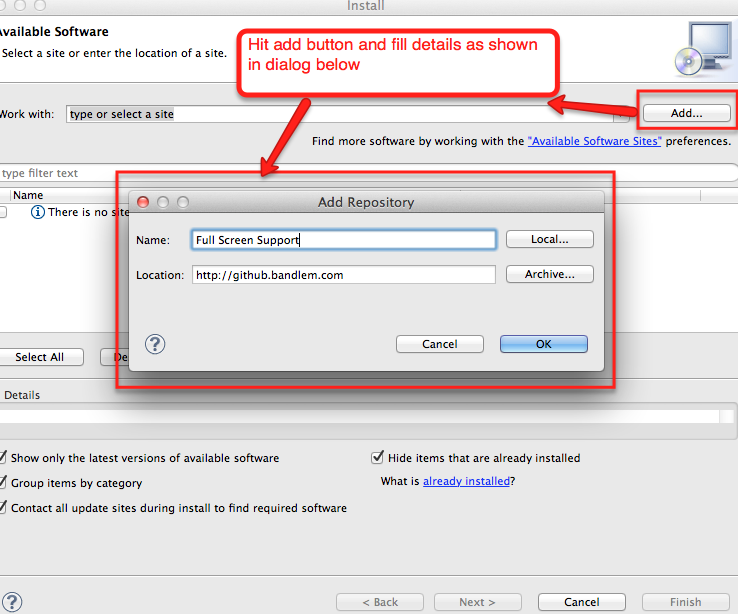 Here is the link to that plugin in Eclipse Marketplace. Sad News : Those who are using standalone Force.com IDE, will not be able to get this update. 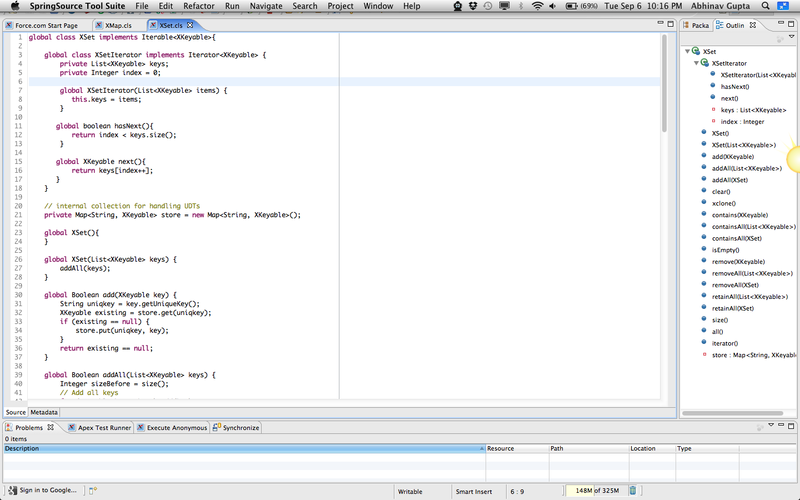 As the force.com IDE version is still based on Eclipse 3.5.2 (Galileo). You guys can try updating the Eclipse base to 3.6 or 3.7 if possible, though the cleanest and easiest move is to move to latest Eclipse(or STS) download and install Force.com IDE as a plugin to that. You will loose nothing, just point your previous Force.com IDE workspace to the new Eclipse installation (do this after installing Force.com IDE plugin for better experience). 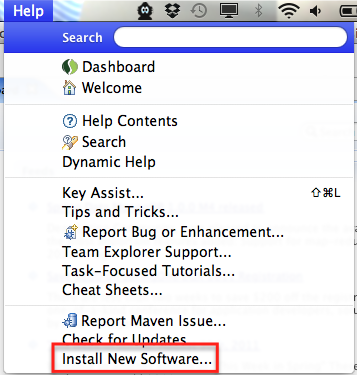 Those who are on normal Eclipse 3.6+ IDE or STS(Spring Tool Suite) distribution can install this plguin easily. You just need to add this update site : http://github.bandlem.com/ and install the plugin available there. Full Screen Pleasure of Coding ! This plugin is nice, only issue I felt is the standard ESC button behavior. Pressing escape resumes to normal screen mode like other full screen apps, though it disturbs the flow of work sometimes. Would be looking forward for your views and experiences with this ! Apex inheritance – Extending managed package abstract/virtual classes & interfaces ! In my recent project, I came across a requirement to create a base class in a managed package with child extension packages would extend to add their value to it. Before starting the actual work, I thought of googling about experiences of force.com community members about the same. Interestingly I found one relevant link only i.e. this force.com discussion board question. I became doubtful about this working after reading this post, so thought of giving a quick try, before doing it for our customers. The good news in advance is that “this managed package inheritance works”. The fixture for this POC experiment is explained below. Fixture for this experiment ! Inheriting from Managed package apex classes. The above test fixture was packaged. This package was uploaded as a managed package with namespace prefix “abhinav” and was installed in some other salesforce DE org. Classes defined with either virtual or abstract cannot also be defined as global in Developer Edition organizations. They can be defined as global in sandbox organizations. Only private and public classes can be defined as either virtual or abstract in Developer Edition organizations. However, a class defined as global can extend virtual or abstract classes in either Developer Edition organizations or sandboxes. Abhinav: Strange, as I was able to create global classes both virtual & abstract from a DE org. The same was packaged as managed released. Seems this restriction is no more applicable. Salesforce team please confirm ? You cannot add a method to an abstract or virtual class after the class has been uploaded in a Managed - Released package version. For more information about managed packages, see Developing Apex in Managed Packages. Abhinav: This is very much true, so please do a lot for brain storming before finalizing design of classes and packaging it as managed released. Looking forward for your views and experiences on this topic ! More Apex Testing with SmartFactory ! My journey with SmartFactory … ! We started using and liking SmartFactory internally on some of our projects. I was getting continuous feedback from my team about goods and gaps of this API. This attracted me towards this API, I became very much interested in this project and started contributing to fix those gaps for our self and community. The first item fixed was “Field Describe limit reached with SmartFactory.”. Here caching support was added to save describe calls, on creating multiple instances of same object. I am glad to share with you all that, finally all these items are fixed and pull request is raised for merge into the main repos. In the end, I would like to say that Matthew was really cooperative and open in adapting/discussing the changes, this is really appreciable to keep up the open source contribution spirit high ! My Fork of SmartFactory : Fixes for issues 6,7 & 8 are available here only, until my pull request is merged into main repos.